(There are no known photos of Tsali) Photographs by the webmaster. Tsali refused to leave his homeland during the "Trail of Tears." 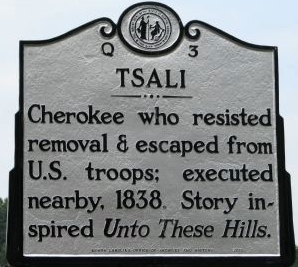 Refusal to obey the President's executive order, aka Forced Removal of the Cherokees in 1838, cost Tsali his life. This “average” man found himself in circumstances he might never have imagined, and his reaction to historical forces much greater than himself made him into a hero and martyr for the Cherokee who remained in the mountains of Western North Carolina. 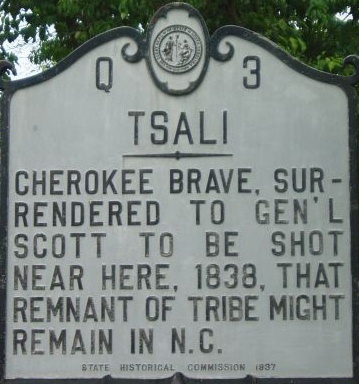 Tsali’s sacrifice, his death at the hands of a firing squad he chose for himself, proved to be a turning point in the history of the principal people; the present-day Eastern Band of Cherokee. 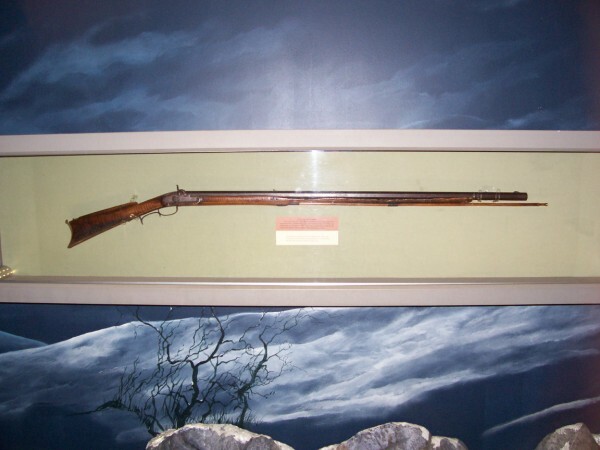 The captives had never intended to kill or wound either of the soldiers, but an accidental discharge during the struggle left one soldier dead and turned Tsali, Lowney, and the sons, Ridges and Wasituna, into wanted men. 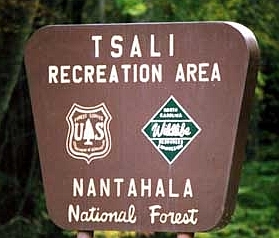 Tsali’s family fled immediately to the safety of a concealed cave under Clingman’s Dome, now a part of the National Park, where Scott’s troops would be at a marked disadvantaged if they ever discovered the fugitives. And Tsali was committed to fighting to the death rather than letting his family become prisoners. Apparently, the fugitives weren’t aware that more than 1,000 other Cherokee were also hiding out in remote areas of the Great Smokies. They had banded together under the leadership of Utsali or “Lichen,” who had sworn never to leave their mountain homeland. Tsali’s family and Utsali’s band eluded capture during the summer of 1838. By fall, the final group of soldiers and Cherokee detainees began the long trip west, a.k.a. Trail of Tears. Faced with the nearly impossible task of capturing the fugitives, General Scott came up with an idea for ending the campaign and revenging the death of his soldier. He sent for Will Thomas, who had been adopted by the great chief Yonaguska. “If Tsali and his kin will come in and give up,” he told Thomas, “I won’t hunt down the others. If Tsali will voluntarily pay the penalty, I will intercede with the government to grant the fugitives permission to remain. But if Tsali refuses, I’ll turn my soldiers loose to hunt every one of them.” When Thomas delivered the message under Clingman's Dome, Tsali agreed to turn himself in. When they reached the stockade, Tsali, Ridges, and Lowney were sentenced to death, while the younger Wasituna and his mother were spared. Recommended Reading: Tsali's Hatchet (480 pages). Description: The Cherokee Trail of Tears comes to life between the pages of TSALI'S HATCHET. Walk in the footsteps and experience an 1836 Cherokee family as they endure the impossible and rise to become the first American Indian Nation to surpass everyone's expectations. "...a gripping story of courage!"